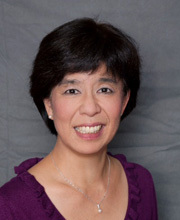 Dr. Yasuko Fukuda, a San Francisco native and second generation Japanese American, attended local schools and graduated from Lowell High School. She has been in private practice for more than 22 years, having joined the office of her own childhood pediatrician, Dr. William Kiyasu after finishing her training, and enjoys watching the growth and maturation of her patients as they progress from infancy to adulthood. Active in the Japanese community of San Francisco, Dr. Fukuda is fluent in the language and has spent many months studying in Japan, learning about the country's pediatric health care and investigating the health effects of the atomic bomb in Hiroshima. Dr. Fukuda received her Bachelor's degree from UC Berkeley, where she majored in both Immunology and Microbiology, and in the Japanese language. She attended Mayo Medical School in Rochester, Minnesota and followed with pediatric residency at Children's Hospital Oakland. She is on staff at CPMC and on the clinical faculty of UCSF where she helps educate the next generation of pediatric clinicians. A Fellow of the American Academy of Pediatrics, Dr. Fukuda is currently the AAP California District IX Chairperson. She also serves as the American Academy of Pediatrics’ liaison to the Japan Pediatric Society and is on the board of the California Immunization Coalition. Through these leadership positions, Dr. Fukuda has worked with many local and national advocates on pediatric issues, including immunizations, work life balance in pediatrics, and access to healthcare for all. Dr. Fukuda’s hobbies include music and singing, knitting, reading and travel. She and her husband, Peter, have 2 Shiba Inu puppies. She enjoys watching Peter and Yoshio, the older dog, in agility trials on the sidelines with Miya, the younger sister.